Alice is a Research Fellow/Trial Manager for the DECODE study at the University of Exeter Medical school, working with Dr David Llewellyn. Prior to joining the College for Medicine & Health, Alice worked for the National Institute of Health Research (NIHR) as a Research Delivery Manager, overseeing an extensive portfolio of studies across a number of disciplines, including; Ageing, Mental Health, Dementia, Neurodegeneration and Neurology. As part of the role Alice collaborated with a number of voluntary, health and private sectors, both on an individual and institutional level, including: acute and mental health trusts, researchers, academics and pharmaceutical companies, on a regional, national and international level. Alice was the South West lead for Join Dementia Research (JDR) and the mental health, dementia and Parkinson’s rater training programs. Before this Alice worked as a Clinical Lead for the Devon Partnership NHS trust, facilitating the successful delivery of a wide portfolio of studies within dementia and mental health. 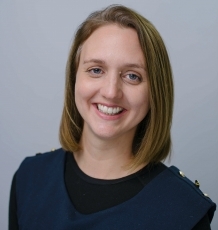 Alice has also worked in several clinical roles, within acute and primary care settings with people experiencing both mild to moderate and acute mental health problems. She is has training in CBT, BSFT, and is an experienced rater in dementia and mental health cognitive assessments. The DEmentia identification COmputerized DEcision support system (DECODE) is an evidence-based computerized decision support system designed for healthcare professionals to help them identify patients likely to have dementia quickly and more accurately. The system uses patient data from around the world and advanced computational and statistical methods and is considerably more accurate than the current ‘gold standard’ cognitive assessments.